Utilizing highest purity and enhanced mechanical stability silica and pure bonding reagents, BR-C18 bonded phases have been innovatively and specially designed to ensure maximum surface coverage and full end-capping, which leads to carbon content as high as 19.0%. The bonding chemistry is completely controlled that results in very reliable column-to-column reproducibility. The maximum surface coverage allows BR-C18 to have exceptional stability, resulting in high pH stability in the range of 1.5 to 10.5. BR-C18 uses full coverage bonded silica packing, which allows high stability at high pH. Figure below shows reproducible retention time for a test compound: toluene after 18,000 column volume runs in a mobile phase of 55% acetonitrile and 45% water at pH 10. 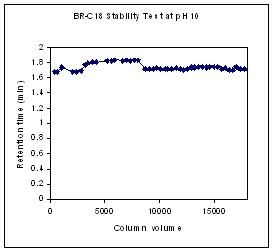 Such high stability allows BR-C18 well suited for validation of various analytes at alkali conditions. The proprietary bonding chemistry for BR-C18 allows achieving high selectivity and high efficiency separation. A BR-C18 column was operated at pH 10.